Psycho Motor Dabrowski had interrupted our discussion about Animal Farm to remind me that I should write a blog post on the topic ‘Gifted – How?’ for the Hoagiesgifted September blog hop. “Some people say that everyone is gifted in some way. Do you think that is true?” Sprite asked me. Yes, everyone is unique and special, precious and of equal worth. Everyone has areas of strength and ability and attributes which some people would call gifts or talents. But NO, everyone is NOT gifted in the sense of the word as we use it here on the blog! “But what about when people say something like Psycho Motor is gifted at bouncing?” asked Sprite. The terms gifts and talents are used in different ways according to the definition being quoted. Prof Francoys Gagne’s DMGT model speaks of Giftedness as innate abilities in a number of different Domains which can be transformed into fully developed Talent if circumstances are favourable. This post is part of the Hoagiesgifted September Blog hop. Gifted, How? The different faces of giftedness. The creative gifted, the math gifted, the chess kid, the 2e child, the introvert, etc. All gifted kids (and adults) don’t all look alike! What does the face of giftedness look like to you? 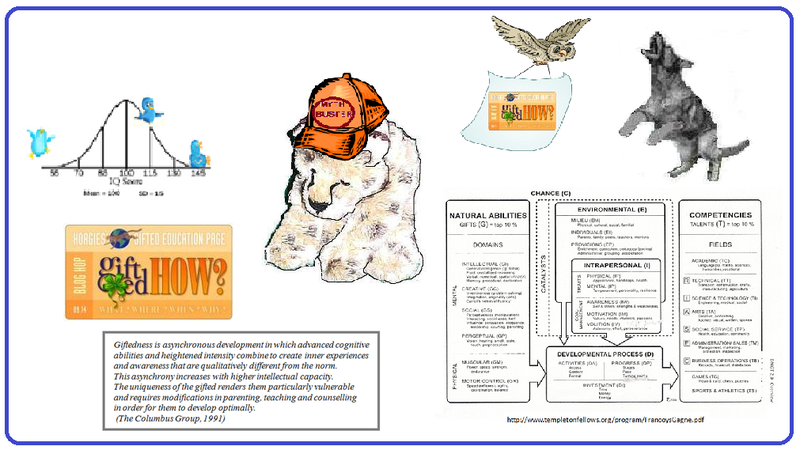 This entry was posted in Uncategorized and tagged columbus cheetah, Gagne DMGT model, giftedness, Hoagiesgifted bloghop, Hoagiesgifted website, myths about giftedness, psych owl ogist by jofreitag. Bookmark the permalink.